Pop Tarts has been heavily promoting the newest additions to their lineup, the "Wildllicious" flavors, which include Wild! Fruit Fusion, Wild! Strawberry, Wild! Berry, and Wild! Grape. Wild! Fruit Fusion seems to be sort of "fruit punch"-like flavor; the others are pretty much as advertised, with recognizable strawberry, raspberry, and grape flavors. The "Wild!" part comes from the brilliantly colored frosting combinations with which the Pop Tarts are topped, not from any use of undomesticated fruit. And the actual flavors of the fillings aren't any more intense or concentrated than the standard, non-Wild! versions. So, if you enjoy Pop Tarts and want something a little more fun to chomp on, by all means go for it. Just don't expect any amazing surprises. My "Grail List" is a list of foods and/or culinary experiences which I'm endeavoring to try. 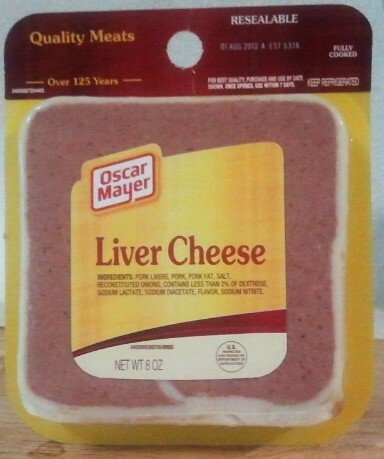 For some time now, I've had Oscar Mayer Liver Cheese at the top of the list. Although this product may be very familiar to some of you, it is apparently unavailable in my part of the country. Whenever I've traveled, I've kept an eye open for it. But now the wait is over, thanks to an anonymous reader who was kind enough to send a package of it to me. Oscar Mayer Liver Cheese is for the most part a square liver loaf, made with pork livers, pork, and dehydrated onions. It's surrounded by a thin layer of lard, and there are bits of livery aspic clinging to it here and there. I'm sure that more than a few of you have already started to shudder, if not at the mention of liver, at the layer of lard and the prospect of finding bits of liver jelly around the edges. But I must say that the most extraordinary thing about this lunchmeat is how ordinary it is. So: overall a pleasant and tasty experience, though one I can recommend only to readers who already enjoy liverwurst. Oscar Mayer Liver Cheese isn't going to change the minds of the haters. Special note: The same anonymous donor also sent along a Sweet Sue whole canned chicken which I plan to open and enjoy with the family later this week. Label instructions say to chill it before opening, so at the moment it's in the fridge. I promise to reveal it in all its glory a little later. When Americans think of "potato crisps" - dehydrated potatoes in chip-like form - most think of Pringles or Munchos, which are the category leaders. But recently, I found some very different potato crisps in Ocean State Job Lot: So Long Potato Crisps. Their marketing tagline is "So Unique, So Fun, So Snacky." Although the flavors available are fairly standard for potato snacks (Sea Salt, Sour Cream and Chive, Cheddar, and BBQ) the form is certainly unique. Instead emulating a potato chip, So Long decided to just extrude long sheets of potato substrate and sell them just like that. 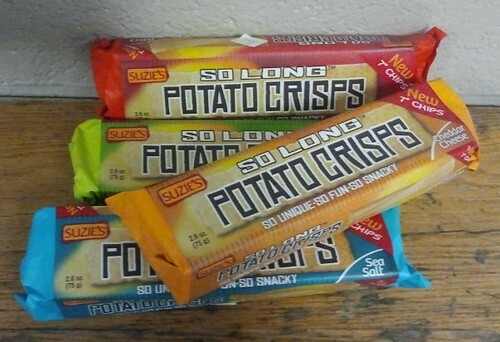 So what you get is a long, thin package of seven-inch-long tater crisp rectangles as shown in the photo at right. The package says that they're made in Latvia, so we had a good time speculating that perhaps these might be made with some clanky Soviet technology left over from the Cold War. Okay, so they look funny. How do they taste? Sea Salt: Pretty standard, lightly salted dehydrated potato taste. Not nearly as starchy-tasting as Pringles, and not as salty as Munchos, they have a flavor profile remarkably similar to cheap instant mashed potatoes. BBQ: Most barbecue-flavored potato chips and crisps go pretty heavy on the tomato powder and add lots of sugar and smoke flavoring. I don't like BBQ chips very much. So Long BBQ chips, in contrast, are much more subtle and very, very light on the tomato. There is a light aroma and taste of smoke, but they're much less aggressive than the usual product. Sour Cream and Onion: Here again, the flavor is exceptionally subtle, almost to the point where it isn't very noticeable. The sour tang is a mere hint, and there's hardly any onion flavor at all. Cheddar Cheese: And once again, the flavor here is more of a suggestion than a demand. You can tell they're supposed to be cheese, though, because they have a faint orange hue to them. Each packet is about 2.6 ounces and is enough for two or three people to share. The regular retail price at Ocean State is a dollar a package (too high, IMO) but the sale price I bought them at was 3 for $1.00 (great for buying some for review.) They were okay, but so unexceptional that I won't go out of my way to purchase them again. Lynnafred and I were headed north on US 5 in Western Massachusetts on other business when we spotted a small hand-lettered sign at the junction of US 5 and MA 116, promising us a visit to a smokehouse if only we would take a short 2-mile side quest. That was too tempting to resist, so off we went. Sure enough, we soon found Pekarski's Sausage, a small company that makes good, honest sausage and smoked meats in small batches by hand. I can't even begin to list all the products they had available, but I can give you an idea of what they had in the twin display cases running the length of the store...along with a few reviews, since we bought a bunch of stuff to try out. 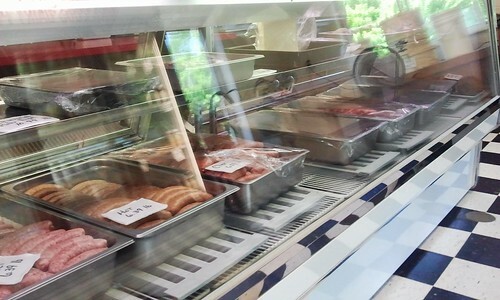 In photo of the meat case on the left, you can plainly see their kielbasa. It's awesome. The spice blend and smoke is absolutely perfect. Many commercial kielbasas are either runny with grease, or so dry that they crumble. 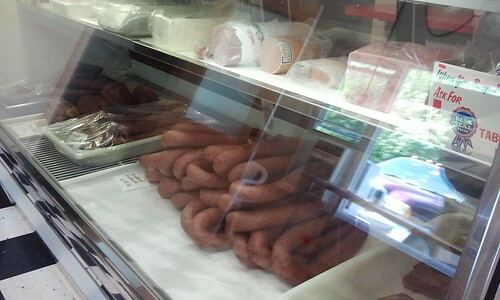 Kudos to Pekarski's, because they have the most ideal ratio of fat to meat I have ever tasted in a kielbasa. In the background, just barely identifiable, are Daisy Hams. If you're from New England, you might be familiar with them - in the 1970's, they were very cheap and common in the supermarkets here. They used to be a boneless pork shoulder, rolled tightly, cured and smoked, and they were sold in tight little plastic-wrapped cylinders that needed only to be boiled with some spuds, carrots, and cabbage for a traditional New England Boiled Dinner. As time has passed, Daisy Hams have gotten a lot more expensive, and a lot crappier. The last time I bought one in the supermarket, it seemed to be a conglomeration of meat scraps and chunks of random pork fat, and it wasn't very good. Not so here at Pekarski's. Their Daisy Hams are rolled and smoked in a mesh sleeve, and it is totally obvious that they're making them the old-fashioned way, out of boneless pork shoulder. We didn't buy one on this trip, but we plan to pick one up next time. Pekarski's slab bacon is excellent - much better than the usual supermarket bacon, and easily the equal to my own homemade dry-aged bacon. We bought a pound of it and had the butcher slice it at nice and thick. Next time I think we should get two pounds. On the other side of the case were various sausages and links. Their breakfast sausage is, to use a wicked overused term, amazing. The links are roughly twice the size of ordinary breakfast sausage links - about the same size as a hot dog. They fry up wonderfully - moist and delicious and not at all greasy. The spice blend is excellent; I was able to identify sage, thyme, and maybe a bit of coriander and some pepper. Really top-notch. Lynnafred couldn't resist picking up some chorizo, which turned out to be far and away the best tasting chorizo EVAR. Plans are in the works to use Pekarski's chorizo in a batch of arroz con gandules. Also available the day we were there: Back bacon (aka Canadian bacon), bratwurst, unsmoked (fresh) kielbasa, fresh pork ribs, smoked pork ribs, smoked pork chops, whole smoked chickens, and whole smoked Cornish game hens. And probably more stuff that I either didn't notice in my wide-eyed wonderment or have forgotten about. I spoke to the butcher when we were there, curious to find out where they are sourcing their pork. 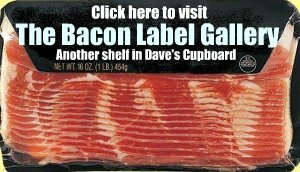 I sometimes have trouble finding good quality pork belly when I make my bacon, and was wondering if they had a local source. They told me that most of their pork comes from farms in New Hampshire. Cool - keeping it regional. 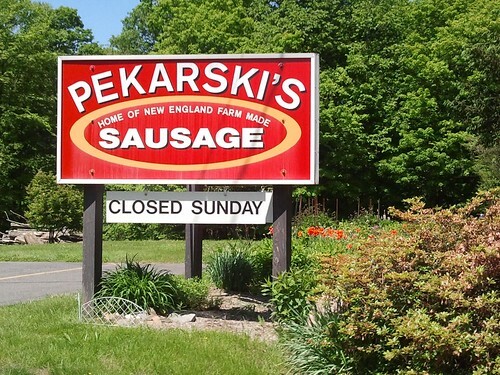 Seriously, Pekarski's is a hidden gem of the Pioneer Valley, and even though it's a good forty-five minute drive from my house to get there, the trip is worth it (and besides, if you get off the highway and take MA 116 all the way there, the back-country drive is gorgeous.) The prices are slightly higher than what you'd pay for mass-market stuff in the supermarket, but the vast improvement in quality and freshness more than makes up for that. No credit or debit cards accepted - cash or check only. 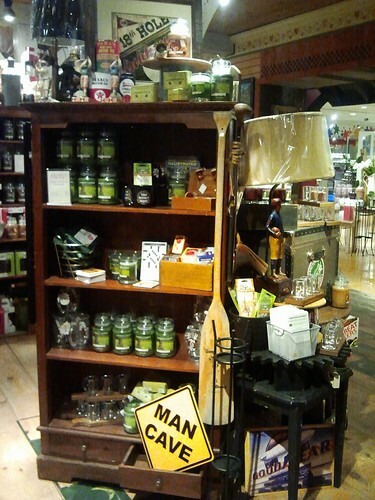 Two days ago, the news broke that Yankee Candles had begun marketing a line of candles to men, imaginatively called "Man Candles." Lynnafred and I were heading up to Greenfield, and Yankee Candle's home store in Deerfield MA happens to be right off of I-91 on our way, so we decided to stop in and see what these Man Candles were all about. 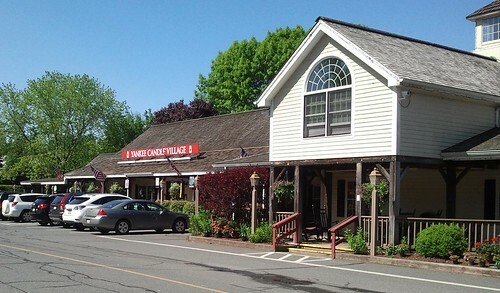 Yankee Candles in Deerfield is a "destination store," as well as a popular stopping point for vacationers traveling north to Vermont, so it's usually packed. We were lucky on this early Friday morning to find few customers. Not many customers. Tons of candles, though. The place is a maze of showrooms. We wandered around for a while before finally giving up and asking a very friendly sales associate for help. On the way to the store, Lynnafred and I were joking about the Man Candles, calling them "Mandels." So of course, when I inquired about them, I asked the sales associate where we could find the "Mandels...uh, sorry, I mean the Man Candles." She took it in stride, though, and just laughed and pointed the way. We would never have found it without her help. 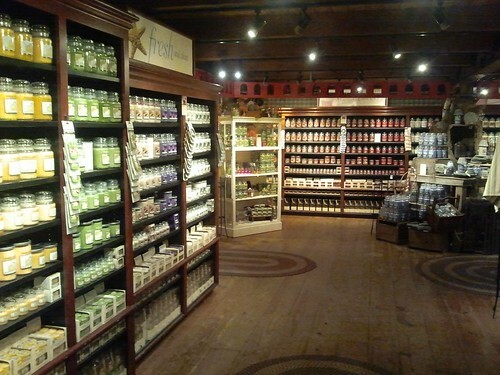 Yankee Candles has about a billion square feet of retail space here, with multiple duplicate displays scattered here and there grouped by theme. But the Man Candle display is this small, 4-foot by 4-foot cluster in one of the side rooms. It really was rather underwhelming. 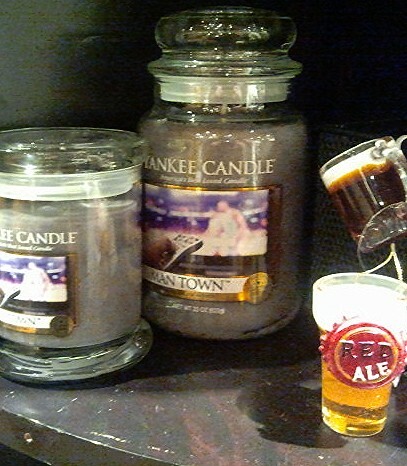 Since just about every other scent in the store was represented by sixteen thousand candles each and the Man Candles were lucky to show a couple dozen in the frontages, we guessed that Yankee is gingerly dipping their toe into the testosterone pool here. 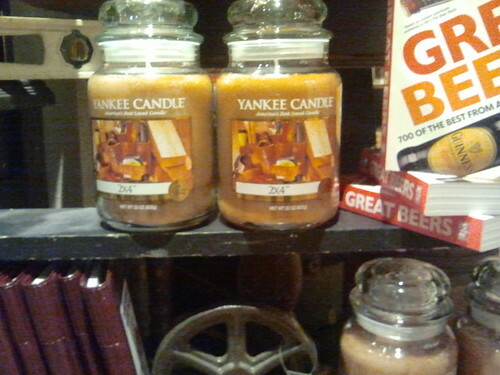 Yankee Candles' Catalog Says: Escape to the man cave with this masculine blend of spices, woods, and musk. Helen Says: "It reminds me of the cologne a stationery salesman would wear." Our Impression: Lynnafred and I took a snort of the fragrance, looked at each other, and said - both at the same time - "It smells just like Axe!" before breaking out in laughter. I don't know what we expected, though I imagine a place called "Man Town" would smell more like old pizza boxes, sweat socks, stale beer, and crotch. Yankee Candles' Catalog Says: Hot sun. Cool breeze. And the intensely summery scent of freshly cut grass. Helen Says: "This is one of my favorites." Our Impression: Very grassy aroma, but more like a freshly cut field than a suburban lawn. The smell I experience from freshly cut grass has fruity, almost watermelon-like notes to it. Wandering the store, we found another fragrance YK calls "Green Grass" with the description, "Nothing says summer like the familiar heady scent of a freshly cut lawn." The only difference between Riding Mower and Green Grass, besides the name and arguably more masculine label design on the Man Candle, was a touch of perfuminess in Green Grass. Yankee Candles' Catalog Says: Game on! This combination of orange, patchouli, vetiver, and leather is as exciting as game day. Helen Says: "It smells like leather and sweat." Our Impression: Leather, yes, but not just any leather. 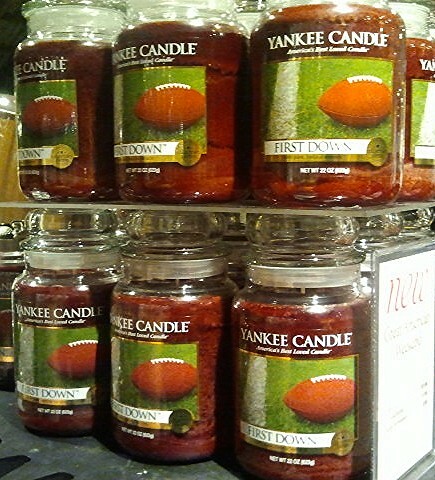 First Down really does evoke the smell of a well-used, well-oiled football. Unfortunately, the rest of the fragrances combine to smell like an electrical fire. Also, patchouli's association with hippies totally disqualifies it as a men's fragrance. Yankee Candles' Catalog Says: The warm, unmistakable scent of freshly planed wood and sawdust evokes a sense of confidence and quality. Helen Says: "This one really needs tweaking. It doesn't smell like sawdust at all." Our Impression: 2 x 4s are usually pine or spruce, and so the sawdust that results from framing a shed or building a workbench generally smells woody, a bit resinous, and a little like freshly grated nutmeg. The smell of genuine sawdust and shavings is one of my favorite things. And Helen is right - these candles don't even come close. There is a strong woodiness to the scent, but it's an "old barn" smell, not "freshly planed wood." 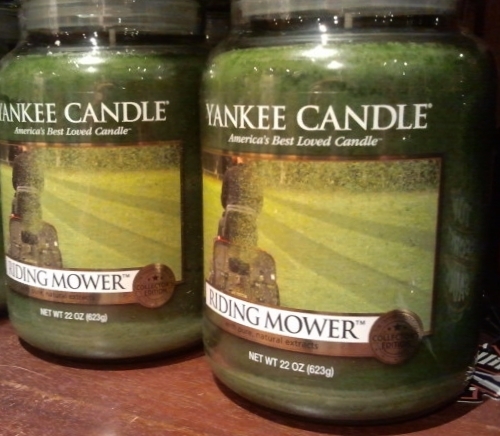 If I were going to buy any of these candles, it would probably be "Riding Mower." It has the most authentic of the aromas. Even at that, I don't think I like it enough to spend thirty bucks on it. I'll just go outside and cut the lawn. 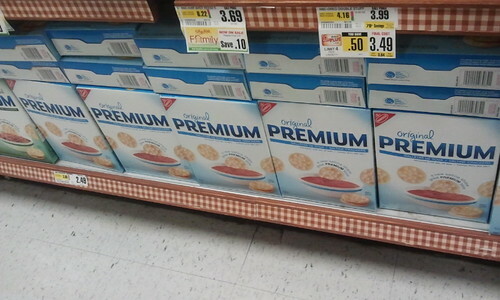 Has Nabisco backed down a little on the price of the new round Premium Saltines? As reported here on May 4, the new and smaller 10.5-ounce boxes had originally hit the shelves priced at $2.49, the same price that Nabisco had been selling 16-ounce boxes of square crackers. Now, the regular price has been reduced to $1.99. 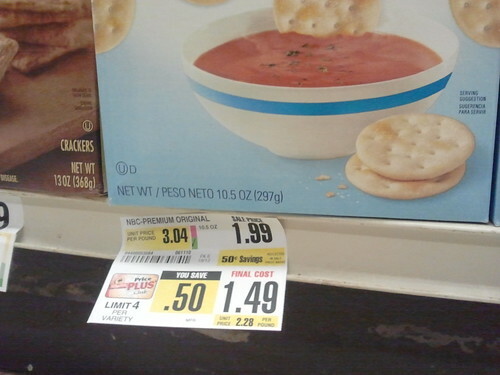 That's better, but it's still jacking the price per pound up by 55 cents. In April 2009, I wrote a blog post about ScanIt!, a hand-held scanner you can use in Stop & Shop to tally up your groceries as you shop, and then breeze through the checkout line in seconds because your shopping is already tallied, bagged, and ready to pay for. I use it all the time because it saves me tons of time in the store, and even if I have a huge cartload of items I can still check through the express lane since I only have one single remaining thing to scan - my shopper's card - before I have to pay. Now, Stop & Shop has brought that innovation to my smartphone. 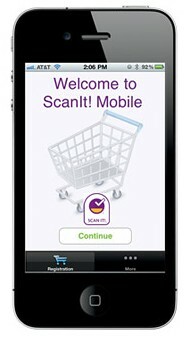 Available now for Android and iPhone, ScanIt! Mobile puts your shopping right at your fingertips. Use your phone's camera to scan the bar code on your shopper's card. Now, instead of having to carry a scanner around in the store, I can just start up the app when I walk into Stop & Shop. The app automatically connects me with the store's wifi network and hooks up the ScanIt! database, and I'm ready to scan items for checkout. The app also delivers special offers and any electronic coupons you may have loaded to your shopping card. At checkout time, I just scanned the "I'm Done!" barcode at the register, paid, and left. Easy. It's pretty great. In my testing, I did find a couple of bugs. The software has some trouble with colored barcodes. Some of Stop & Shop's frozen veggies, for example, have green barcodes on the packaging and it took a couple of tries to get the barcode reader in the app to recognize them. ScanIt! Mobile automatically turns on your phone's wifi connection when you start it (so it can connect in the store.) But you need to remember to shut your wifi off when you leave the store, because the app leaves the wifi active when you exit from it. Other than those little quibbles, I thought it was pretty sweet. One less gadget to carry around the store, and the functionality was pretty good. Thumbs up. 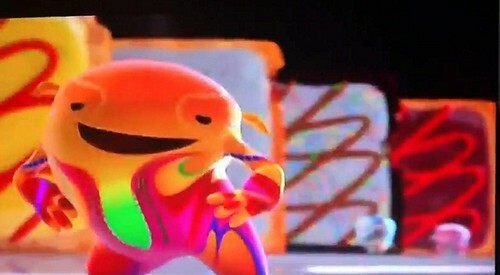 Now if Stop & Shop could just get a Twitter account, I'd be perfectly happy with them. 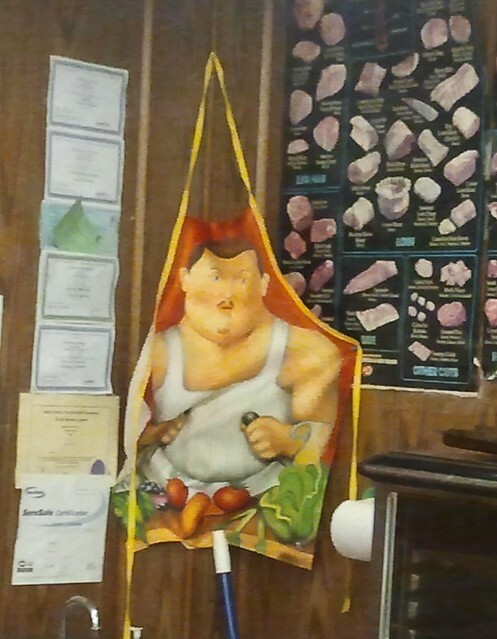 Once seen, this apron (hanging in a local deli) can not be unseen. A few years ago, I thought it would be hilarious to make beef jerky out of bull penises and market them under the brand name "Pizzle Sticks." My wife, however, thought less of this idea than I did and so the concept went no further than a couple of rude pencil sketches. Just as well, I guess, since I found out that pet snack companies have already been doing this for years. The snacks are called "bully sticks," and the packaging usually says that they're made from "100% beef bully," presumably because the companies aren't run by people like me with a 10-year-old's sense of humor. The snacks aren't at all dicklike - they just look like rawhide rods with surprisingly small diameters. It got me to thinking, trying to imagine what the companies were doing with the rest of the "bullies." You know, the parts that are dicklike which they have to cut off. Because the pecker ends are so dense when they are turned into rawhide like that, they're very dense and keep the dogs busy for about an hour whenever they get one. And judging by the way they will perform a circus' worth of tricks to get one, they're apparently delicious. Geez, have you priced pastrami at the deli lately? Nine bucks a pound! Also, I happen to like my pastrami with some fat on it like they used to make when I was a kid, and that stuff is getting harder to find these days. In my youth, Plate Pastrami was common. As you can probably figure out, it's made from beef plate, the fatty "belly" area of the beefer which is also the source of short ribs. 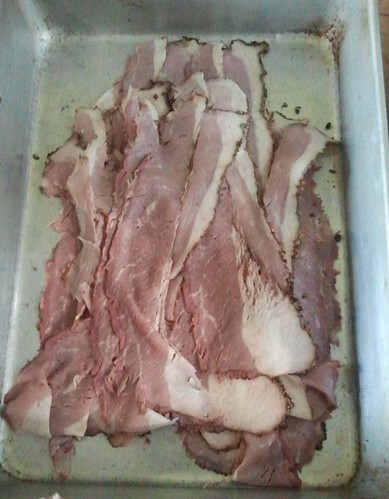 Plate pastrami gets a lot of it's textural character and richness from the fat which is integral to the cut. It closely resembles bacon, which shouldn't be surprising. Bacon is cured and smoked pig belly, and plate pastrami is cured and smoked beef belly. Plate pastrami is hard to find these days; most supermarkets and delis don't carry it, and if you want to make your own the plate cut often has to be special ordered from a trusted butcher. This rarity is market-driven - while once upon a time, consumers wanted flavorful fatty meat, they are now demanding leaner cuts, and there is no way anyone can describe the plate as "lean." This is why so much pastrami sold nowadays is Round Pastrami. It's made from the round of the beef, which is very lean. It's very popular and has all but replaced plate pastrami in supermarkets and most delis, but I don't find it at all desireable - pastrami should have some fat on it! And so, without ready access to beef plate and without any interest at all in curing a round, I direct your attention to the brisket, the cut just in front of the plate. Brisket Pastrami doesn't have quite as much fat as a proper plate pastrami, but it's not bad. It's actually a pretty good compromise between the very fatty plate and the very lean round. And because briskets are pretty easy to come by, you can make pastrami just about any time you want. Pastrami starts out as a brine-cured cut of meat - a corned beef, actually. There are many perfectly acceptable commercial corned beefs out there, so when I make pastrami at home, I start with a commercial corned beef rather than a fresh brisket. That allows me to skip the curing process and get right to the seasoning and smoking. Remove the corned beef from the wrapping, drain off any juices, and rinse it off. You can also use this opportunity to trim some of the fat and membranes off. I remove the membranes, but only minimally trim the fat. Notice that this is pretty much an untrimmed brisket. Remember, fat is flavor. 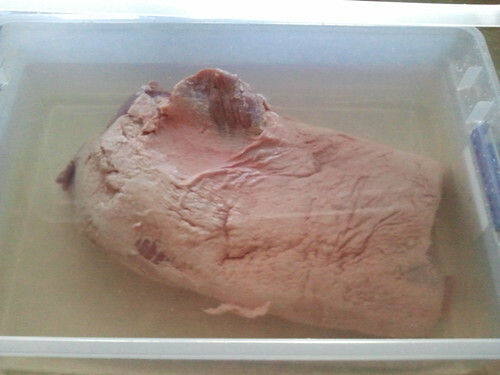 Place the corned beef into a container and add enough water to cover the pastrami. Let it sit and soak for about twenty-four hours or so. You don't have to change the water - just make sure the meat is covered by the water. The idea is to soak out a lot of the salt that's in the corned beef. As the beef cooks over the smoke and turns into pastrami, it can lose up to 20% of its weight, which will concentrate any salt remaining in the meat. Without this soaking step, your finished pastrami will be almost unbearably salty. The next day, make up a batch of Pastrami Rub. The most basic of pastrami rubs contain black pepper and coriander with a touch of paprika. Over time, I've developed a rub that gives me exactly the flavor I'm looking for, and that's the recipe I'm sharing here. I encourage you to do some experimenting, too, so you can find your own perfect blend. 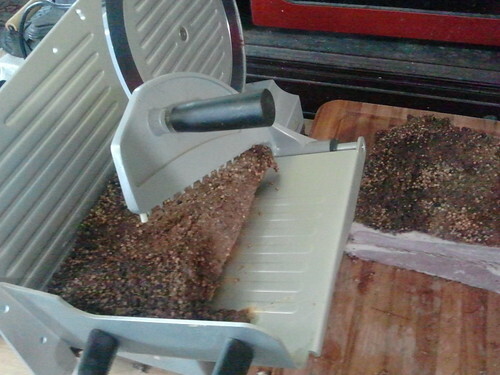 Makes enough to transform 1 average point cut or flat cut corned beef into pastrami. If you're using a whole brisket, double the recipe. Grind the peppercorns, coriander, and mustard seed coarsely in a spice grinder or use a mortar and pestle. Add the paprika (use a good quality Hungarian paprika if you can, not that nasty red dust they sell in dollar stores in plastic tubes) and salt, stir well to thoroughly combine. Take the brisket out of it's soaking water and pat it dry as best you can. Rub the spices liberally onto every square inch of the brisket's surface, pressing the mixture into the surface as you go so there is a decent coating of spices. 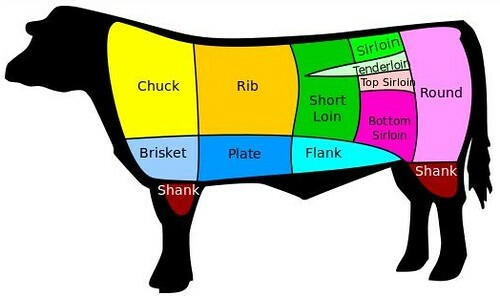 With the beef well-coated, put it into the smoker and hold it over the smoke at 250 F for three or four hours, or until the internal temperature of the brisket reaches 165 F on a meat thermometer inserted into the thickest part of the meat. I like to use a mild wood for the smoke - apple is good, and so is citrus wood and maple. Take the brisket out of the smoker, wrap it up well in aluminum foil, and chill it thoroughly. Cold meat slices better than hot. When the meat is cold, slice it as thinly as possible. I have a meat slicer, but if you don't, that's okay - use a good sharp slicing knife and make thin, uniform slices against the grain. Check that out - isn't it just gorgeous? You can eat it just the way it is if you like - remember, it is fully cooked - but you can also sizzle it a bit in a frying pan or, if you've trimmed a lot of the fat off it first, steam it. Get yourself some good rye bread, some sharp mustard, and some strong horseradish if you so desire, and have yourself a feast. At first, I didn't think anything of it. 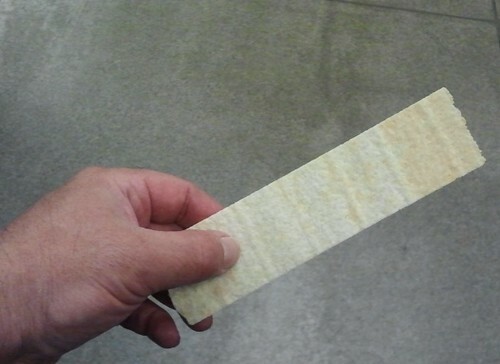 Round saltine crackers are really nothing new and there are already several companies that make them. But the more I thought about it, the more the news kind of bothers me. Yeah, those are all the new round crackers. There's no choice because all of the square Premiums are gone, totally replaced by the round ones. Also notice how much shelf space is devoted to the new item. Nabisco is really pushing this one hard. That bugs me. Almost as much as calling them "original" Premium Saltines. Sorry, Nabisco, but these crackers were originally square. You're not going to get people to forget square saltines by just calling these new ones "original" and banishing the real saltines. But what is most wrong about this whole thing is the PRICE. The new packages are 10.5-ounce net weight compared to the old ones at 16 ounces. But you'll notice from the shelf tag that they're charging the same old $2.49 a box. Here's a tip, folks. ALDI and Price/Rite saltines are exactly the same product as the old, square Premiums. In a blindfolded taste test, you'd never be able to tell them apart. But they're 89 cents for a one-pound box and have been for years. Buy those instead and let Nabisco go to hell. My dogs, Zim and Iris, are spoiled. They've become used to a regular schedule, and they bug the hell out of me if there's any variation to it. So., every morning (including weekends and holidays) they want to go out at 5:00 AM, followed by breakfast at 5:30. At night, they want their supper at 5:00 PM, followed by out at 6:00 PM, and a snack by 7:00. At eleven years old, Zim's teeth are starting to get a little fragile, so I've backed off on the marrow bones lately, trying to go with other things he likes, like pig ears. But this weekend, I found some stuff that was so bizarre I couldn't resist buying a couple packages to see whether the dogs would like a little variety. 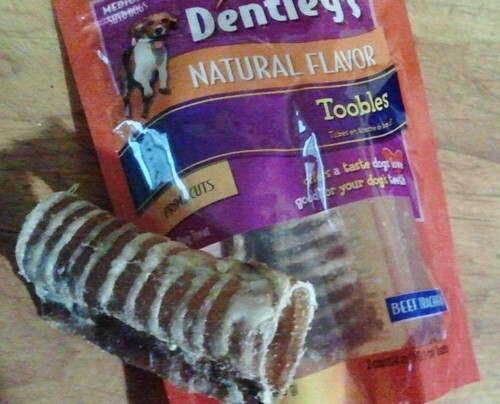 I was in the snack aisle, and noticed packages of things labeled "Toobles." They were tubes. I picked up the package and looked inside...and thought, "Hey, those look like windpipes." And then in fine print near the bottom of the package, I found it: "Beef esophagus." They are windpipes! Totally awesome. Like I said, i couldn't resist them. enough. She likes to play with her food. The dogs couldn't resist them, either. They loved 'em. 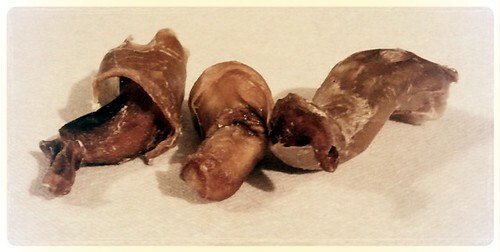 To me, they smelled like run of the mill rawhide but with little rings of connective tissue holding the dried meat parts together. But to Zim and Iris, they were manna. 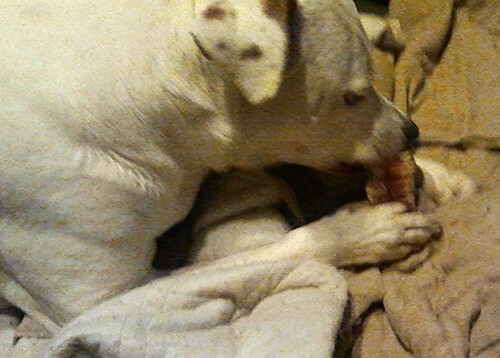 And surprisingly, it took them quite a while to chomp through them, so they got the same amount of satisfaction from them as they do from bones. So, if you're looking for something a little different for the dawg, give them a try. I found them at the local PetSmart, but you may have to do some searching of your own to turn them up.